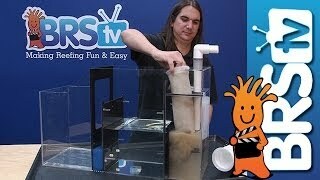 Filter Socks are used on overflows to remove small floating particles from aquarium water. This can dramatically improve water quality and reduce maintenance on filters that would otherwise become clogged. BRS recommends starting with felt socks and switching to mesh if they clog faster than desired. 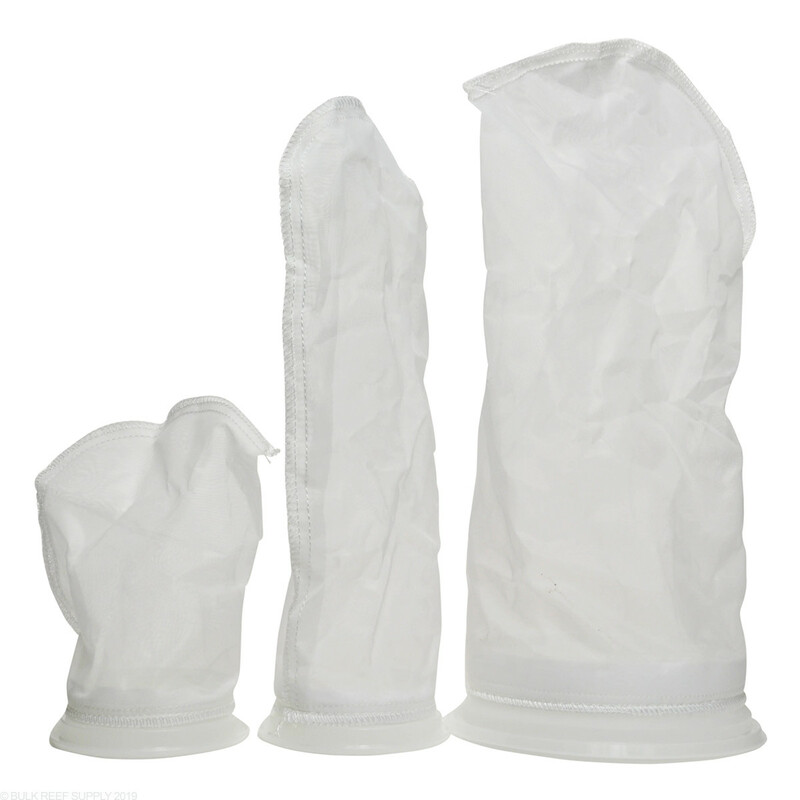 Mesh Filter Sock are less effective than felt but clog less frequently. Plastic ring fits common sump holders. 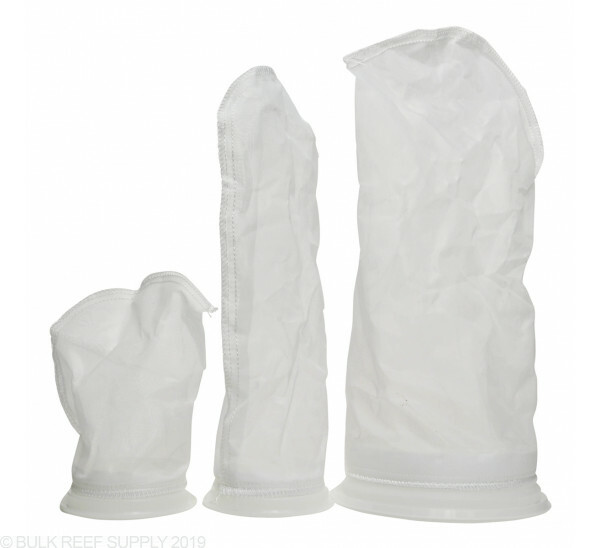 Filter socks come in mesh or felt and with a plastic ring or draw string for differences and unique advantages. Regular use will result in crystal clear water most convenient form of mechanical filtration. Those who have posted bad reviews over felt, well DUH. They are a more open design and will not catch everything like felt. THAT is the reason I use them plus to run carbon occasionally. I need to keep nitrates up and don't require everything to be caught. Performed as expected and keep the felt on standby for when the water needs polishing. Having always used the felt socks I thought I'd give these a try. While they may not catch as much of the superfine particulate it does a very good job. SOOOOOO much easier to clean than the felt socks. The remaining detritus is taken up by my skimmer and what does remain can be siphoned out of the sump during any water changes. The time saved cleaning socks is worth the little extra time siphoning the detritus from the sump. My sump has a two filter sock set-up. I run one felt and one of the mesh. Water quality is good and the mesh sock clean SO much easier and hold up very well! I can’t believe how disappointed I am I these. I bought them to extend swap times over felt. But I have found they clog in half the time making them utterly useless! Normal filter socks last me 3 days. These are clogged at the end of the next day. People say they are easier to clean which may be true. I just run a wash once a week so I can’t say anything about hand washing. Love these mesh socks. Much easier to clean than the felt and pretty tough. I have used mine about 10 times each and they look almost brand new. A very nice product and it makes cleaning a breeze! I mix the mesh socks with the felt socks. Love these socks easy to clean and don's clog up in your sump. I wanted to like these for the price, but I know have tiny pieces of felt blowing all through the tank from these economy socks. What a mess. I started using mesh a few months ago. This material is a bit lighter and thinner than my others, but seems well made. Used and washed a few times now and holding up well..
Not impressed at all, I purchased four of these for comparison to traditional felt filter socks. I've been running the felt filter socks for years now. Before I purchased the mesh socks I had very little detritus in the sump. As other reviewers state there is detritus all over the place down there. While these may snag all the big stuff the mesh does not polish the water. The mesh socks simply let more crud pass through than felt socks do. That will collect and build up in the sump. I will toss these into storage for use in an emergency and go back to felt socks. Works great, good price and free delivery. Will these work for a Red Sea Reefer? Sourcing their socks is making me wish I went in a different direction tank wise. The Red Sea Reefer Socks are 4.5" in diameter and most other filter socks including our BRS brand ones will just fall straight through. You may want to make an adapter plate to accept a standard 4" filter sock. You should be able to make an adapter out of a piece of acrylic and a wholesale. Will these fit in an aqueon modular proflex sump? The 4" filter socks will fit perfectly! Feel free to let us know if you have any further questions! What micron rating are these mesh socks ? All of our filter socks are 200 micron. What material are the mesh socks made from? They are made from polyester. You sure can! I personally think the mesh ones are a bit easier to clean then the felt, though you will probably get more cycles out of the felt as its a bit more durable material.